Tips on How to Make Your Own Ceramic Travel Mug! Create Your Own Ceramic Travel Mug and Reduce Landfill Waste! There are some important considerations you must take when making a ceramic travel mug so it actually travels and functions well. For instance, it must have a lid so it doesn’t spill, and it must fit into car cup holders. Lucky for us, Sumi von Dassow did the research and in today’s post, an excerpt from the Pottery Making Illustrated archives, Sumi shares how to make one of the key components of a travel mug: the lid. I am so excited to give this a try! – Jennifer Poellot Harnetty, editor. P.S. Learn how to throw a tall cup with a gallery (and a perfectly fit lid to go with it) in Sumi von Dassow’s complete article in the September/October 2016 issue of Pottery Making Illustrated. 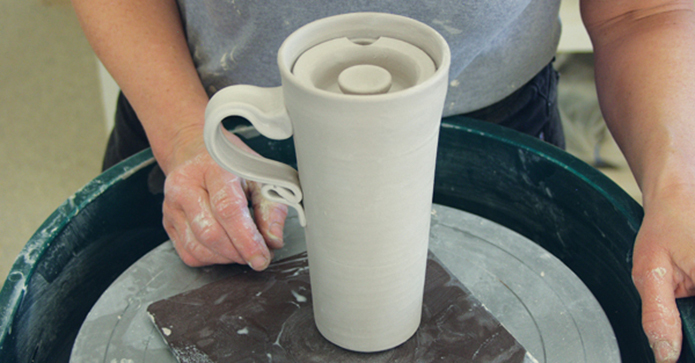 To finish the mug, attach a handle exactly between the cut-outs in the gallery. Make a mark 7 cm above the foot and attach the handle above this mark (4). Dry the mug slowly with the lid in place. I glaze the mug rim and lid completely and fire the lid separately on stilts to avoid leaving unglazed areas that will get stained with coffee, but there’s no functional reason you couldn’t wax the gallery and the rim of the lid and fire them together. Be sure to use a food-safe liner glaze. base, ceramic, ceramic lid, ceramic travel mug, clay, cup, cut, design, dry, foot, functional, gallery, glaze, handle, handmade, how to make clay, how to make clay mugs, illustrated, learn, lids, mug, mugs, position, potter, potters, pottery, pottery making, reduce, research, safe, shape, slip, sumi von dassow, throw, travel, ware, water, wax. Instead of a plastic liner for insulation, why not use a knitted cozy? Ditch the plastic! Does anyone make a plastic insulated liner to drop in a ceramic cup like this so it will stay hot? I am so excited to try this one. I will leave a comment after I have tried this one. I live on SaltSpring Island British Columbia, one of the gulf islands off the mainland. I will be starting this one tomorrow and post results comments when it is done. Margaret, I am in Montana, USA. I ageee, I have learned much from Sumi Von Dassow’s posts and her book. I also follow Ceramics Arts Daily and subribe to the print version of Pottery Making Illustrated. I would recommend both to all interested in pottery. I hope to try this project soon. I love the tips that I get from Sumi Von Dassow. Living in Australia I am basically the first to show. I do not know why other potters do not follow these tips, but have and will do always. I just love them . I have Ceramics Daily and also Pottery Making Illustrated.